I saw this pickup listed in Hemmings, and clicked though to check it out a little more. Here are a couple of odd things about it. Its listed by a private seller in Haverhill, Massachusetts. 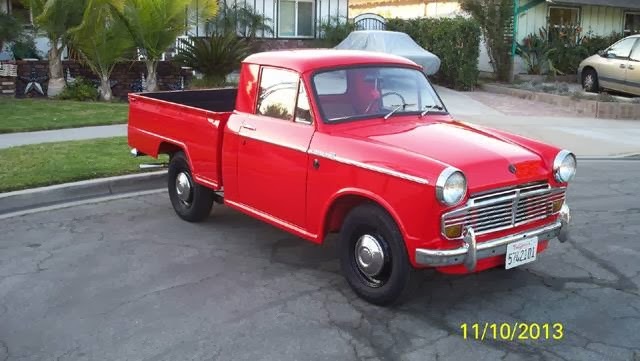 "1965 Datsun “one off” Extended cab pick up truck, near perfect in every way! 46.917 miles from new. Cab is extended 7” and this show truck needs nothing! They may have just bought the truck and are looking to flip it, but you would think they would at least use their own picture. The truck in the picture, dated last month has a California plate, and judging by the palm trees, and the rest of the background, I would say this looks like the truck is in California. Then onto the truck itself. It says its a one off with a 7 inch extended cab. Generally the more original something is, the more money its worth. It is definitely one of those buyer beware kind of listings. It would need some more explanation to me before I got serious on it. Just one of those curious things, there may be perfectly reasonable reasons, but it screams caution to me.